But, never fear, luckily I still have enough residual Catholic guilt left over to worry that I’m neglecting you, my dear patrons. 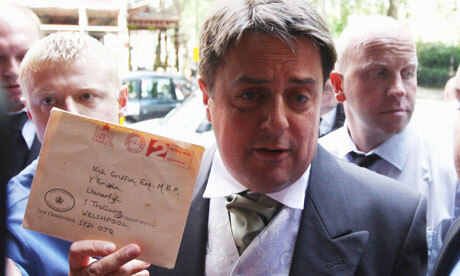 Last week, as you probably know, Nick Griffin, MEP, decided it was time for him – and his twatty 'British National Party' – to stand up for an English B & B owner, who had decided to bar a gay couple from sharing a room in his guesthouse, on some apparent religious grounds. But, anyway, it made me think fondly of a time when Nick Griffin was himself excluded - and from a slightly more famous residence. As an elected MEP, Nick Griffin – the leader of the British National Party – was automatically invited to the Buckingham Palace Garden party last week. That was all it was – a mere formality; a quirk of our democratic system – just Mr. Griffin and eight-thousand other elected parlitarians. When this invitation was rescinded at the last moment on grounds that Griffin had ‘sought to make political capital’ from it, it was funny, sure – but was it right? As much as I consider the man an odious and unpleasant arse (I assume the feeling would be a mutual one, since my parents are Irish immigrants), the decision to exclude him on such a spurious pretext was counter-productive and actually generated rather a lot of unnecessary publicity for him and his ridiculous party. Sure enough, if you look on their website this week (I’m not adding a link), their lead article points out how Griffin’s expulsion from the garden party was ‘unfair and undemocratic’. Annoyingly, this is actually true. Wouldn’t it have been better to allow him into the party? Clearly, since the man is such a massive oaf, all that has been achieved by excluding him is to deny him the opportunity to stand around on his own for a bit (in a stuffy, hired suit), imbibe too much free Pimms and stagger off home with a bit of eggy vol-u-vant hanging off his cravat. But people still seem to think that there something to fear from Griffin. It is assumed that because he went to Cambridge University this somehow makes him brilliant (he got a 2.II in law), and it’s this brilliance that makes him somehow dangerous. But anyone that saw Griffin’s dismal performance on BBC1’s Question Time last year, knows there is nothing to fear here. As a panellist on the show, Griffin came across as an ugly (I’m not talking about his looks here, but, yes, obviously), ill-informed and badly-prepared man, floundering amid a series of very obvious questions, whilst being too cowardly to admit what he actually thinks. * I've just realised that you can see Mr. Griffin's entire home address in this picture. A bit of an oversight, you'd think - it's usually other people's addresses he likes to make public.